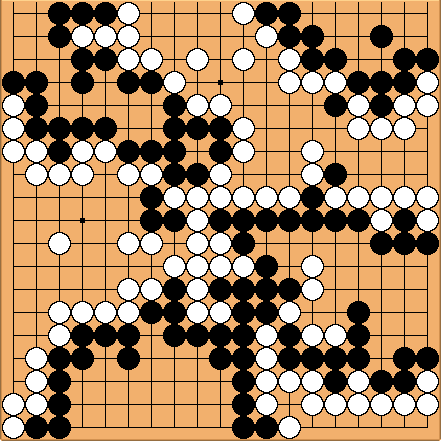 This is the end position of a game I played against GNU go in glGo, with a 5 handicap and 0.5 komi. I am quite new to go and don't understand scoring all that well so I was wondering why it says there are so many neutral points? It didn't count the white areas on the left or upper right for white, and it didn't count the black area on the lower right for black. It calculated the final score to be White 7.5 Black 55. I thought I had lost but instead I destroyed it? I think it was because you didn't mark the white stones inside the black area, and the black stones inside the black area as dead... I thought GnuGo would do that as well, but maybe it couldn't quite see that they were dead. To know more about the various scoring methods that can be used in Go, see Scoring. Ah that makes sense, thanks. I wasn't aware that I needed to mark them dead, looks like I actually lost by 3.5. I would think GNU go could have marked them dead, it passed after I did so it must have known nothing was going to happen with them.